Are you a fan of gallery walls? I'm not sure at what point in time I decided I loved them, but I was very happy with the one I recently did in our living room at home. Before I tackled the project, I knew that I wanted to repaint our living room and purchase a new couch for the space. We've been in our home for 6 years now, and not only was it time for a new coat of paint on most of the walls, I was so ready to make the space lighter and brighter! I guess my tastes have evolved over time. Anyway, we looked around a while and finally decided on a sectional from Haverty's. That's something I thought I'd never want because you are limited in the way the furniture can be arranged in a room. But after living in our home for 6 years, I knew there was one area of the living room that was better suited for the majority of the seating. So we went with a gray/tan fabric sectional.....and are LOVING it! I really do think it's more comfortable than my bed - and that's a good thing when I have to sleep on it all night with Lucy when the weather is bad. For some reason, she thinks we're safer in the living room...lol! Anyway, I collected things over time that I loved and I thought would look great on a gallery wall. 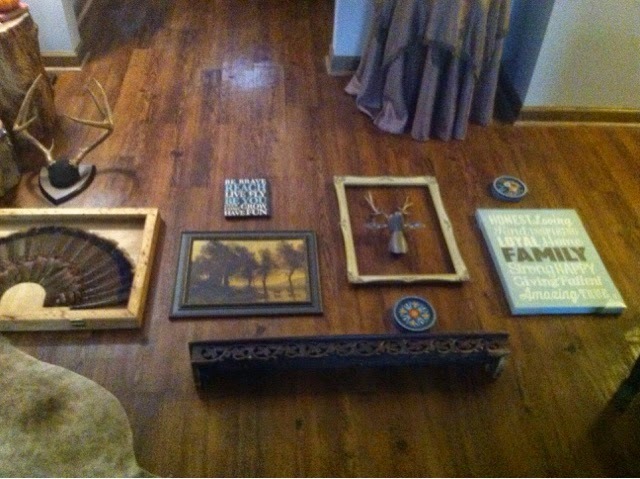 All of these items came from a thrifting trip in Atlanta when we were up there visiting Dillan. I think I paid around $25.00 for all of this! 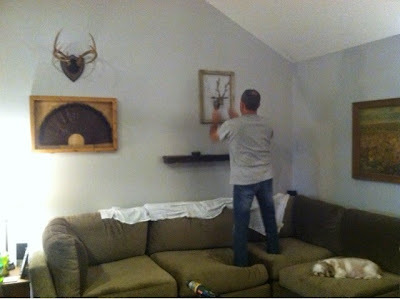 So we got the walls painted and the new couch in place and then the stress hit me....how do I arrange a gallery wall? I didn't want to make a nail hole and then change my mind, so I played around with the items on the floor to get an overall feel for how it would look. I'm a lucky girl because the Mister always hangs things for me. I never have to worry about that. I just tell him where I want it and he makes it happen. Look at Lucy napping on the couch :) She can sleep through anything except bad weather! I have to say that I am very pleased with how the gallery wall turned out! 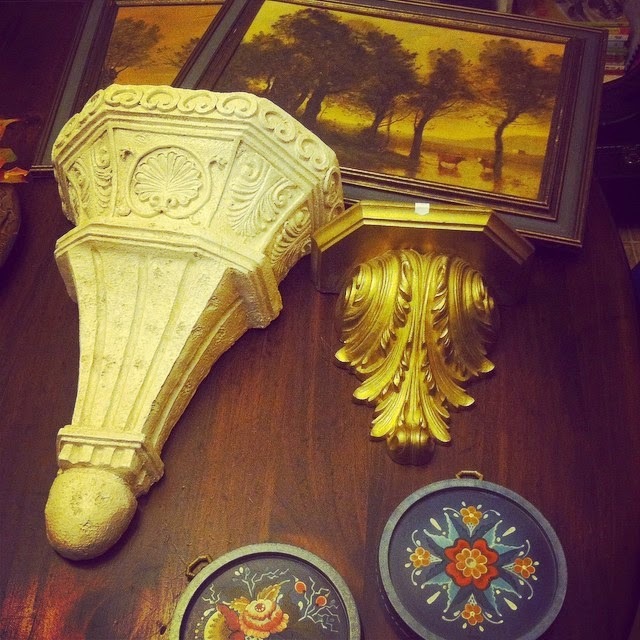 It's so perfect for the large wall space and it's an eclectic mix of things that I/we love. I forgot to mention the new cowhide rug we purchased for the space as well. We love it! As a matter of fact, I'd like to order another one to put in front of the couch under the coffee table to break up some of the wood in the space. And don't you love my stump tables Scott made? I'll have to do another post on them and show you the details. Stump tables are a big thing now in the decorating world, but I've been loving them a long time! So if you've thought about doing a gallery wall in your own home, but were unsure if you'd like it......go for it! It's the perfect way to fill in a large space and add a cozy, eclectic feel to your room. There is lots of inspiration online to help you decide what type of items you'd like to display as well as ideas on how to arrange them. And don't forget to go thrifting! That's the best way to save and find unique items for your space. The new photos look great!